We have created a collection of specially designed spa packages for your ultimate enjoyment! Whether you’re interested in a few hours of relaxation or a full day of bliss, we invite you to heal your mind and body with one or more of these spectacular packages. If you require something more customized, we will gladly accommodate you. 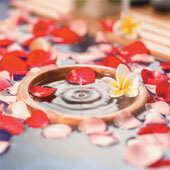 Private spa parties bring people together in a soothing environment that awakens and rejuvenates the senses. At Keopatra Organic Spa & Salon, we pride ourselves in hosting unique and memorable events. No matter the function, our dedicated staff of professionals is committed to taking care of you and every member of your group. Please let us know in advance and we can arrange for organic snacks, drinks, or what ever your needs may be to help you and your guests enjoy your time with us. We do recommend you make appointments in advance due to high demand. A major credit card is required to hold all appointments. We do have a cancellation policy so we ask that you provide us with at least 24 hours notice when canceling a service as there is full charge for cancellations made less than 24 hours in advance and for no shows.